Welcome to the Holiday Inn Manchester Airport Hotel. 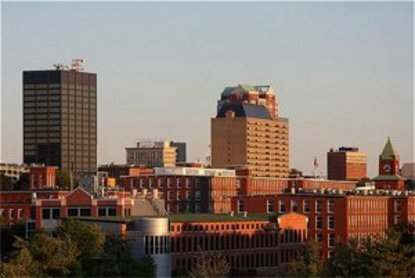 Manchester, New Hampshire's newest full-service hotel, located less than 1 mile from Manchester-Boston Regional Airport. Eat at our Airport Diner for a quick on the fly item before you embark on your journey where guest's Kids Eat Free every day and every meal Holiday Inn Manchester Airport Hotel near Verizon Wireless Arena features 96 guest rooms and suites. Hotel amenities include Complimentary 24-hour Airport Shuttle, Indoor Heated Pool, Hot tub, Fitness Center, Free Wireless High-Speed Internet Access, and 24-hour Business Center.Centrally located, this Manchester, New Hampshire hotel is near Southern New Hampshire University, St. Anselms College, and University of New Hampshire. Convenient to area companies such as Sylvania, Tri-Town Ice Arena, and General Electric. Local Hospitals and Medical Centers such as Catholic Medical Center, and Dartmouth Hitchcock Medical Center are also just minutes away. The best of Manchester is waiting for you at the Holiday Inn Manchester Airport Hotel. Our dedicated staff and services are sure to exceed your expectations. This hotel is committed to providing accessible facilities under the American Disabilities Act. If your accessibility needs are not met, please contact the Hotel Manager on Duty. Should you require additional information regarding accessible facilities for guests with disabilities, please call 1-800-Holiday (U.S. and Canada) or contact the hotel directly. For the hearing impaired, TDD service is available at 1-800-238-5544 within the U.S. and Canada.